August 9th marks the ninth anniversary of the death of the great Palestinian poet Mahmoud Darwish. Poems that eloquently capture the essence and spirit of the Palestinian struggle for independence–this is what Darwish gave to the world. Born on March 13, 1941 in the village of Al-Birwa, Darwish published his first book of poetry at the age of 19. His home village, Al-Birwa, no longer exists, by the way. Located in western Galilee near the border with Lebanon, it was destroyed in 1948. Darwish was seven years old at the time. He and his family and other villagers were forced to flee. A kibbutz and the Jewish town of Ahihud occupy the land today. A week ago I put up a post entitled Solzhenitsyn and the Jews, the purpose of which was to mark the ninth anniversary of the death of the famed Russian writer, Alexander Solzhenitsyn. The parallels between Solzhenitsyn and Darwish are striking. 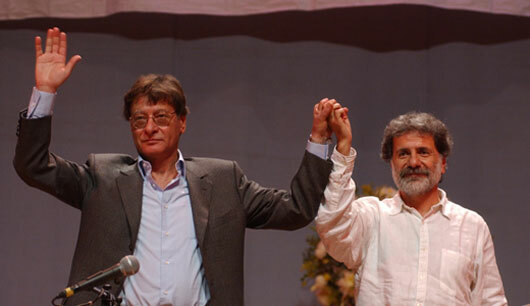 For one thing, both men died within a week of each other–Solzhenitsyn on August 3, 2008, and Darwish on August 9, 2008. Both of course were also great writers. But perhaps most striking of all is both spent a major portion of their lives living under a brutal system of government imposed by Jews–and in both cases the experience powerfully shaped their writing. The Soviet Union, at least in its earlier years, seems very much to have been an example of Jewish power gone berserk. The same of course can be said of Israel. To make a single word: Homeland…..
On June 8, 1987, Darwish published an essay entitled, “The Cruelest of Months.” The essay marked the twentieth anniversary of the 1967 war, a war in which Israel, in addition to bombing the USS Liberty, further extended its control over Palestinian land, capturing East Jerusalem and the West Bank. No one is safe from the pain of memories, or from psychological collapse. June is the cruelest of months. June is an abyss which tries to ascend from its own depths to improve the conditions within it. A strained hand is raised to prevent the wall from collapsing and a strained cry rings out: let whatever is collapsing collapse–let our internal pain complete its twentieth year. The passing of twenty years startles us as we ponder what time can and cannot do. Twenty years of pain that we try to forget, but which pursues us. Whoever was born then, in June, is now twenty years old–children familiar with rocks and small rockets, with prisons, children who have lived abnormal lives. We see to what extent we have been further scattered and to what extent the homeland has narrowed. Twenty seasons of burned wheat. And as we bid the years farewell, the ideas of youth fade. They would have remained young if night had not been confounded with day. June is the cruelest of months. Because we are witnesses of the event. And turning back to that part of this age which has already ended, this age which defies proper description, does not enable us to escape the fever or to ascertain its origins: is it the past that has taken with it the memory of the defeat and gone away; or is it the present, incapable of separating itself from the spectacle of the defeat and its history so that the past remains capable of repeating itself as long as the reality of the defeat is present in the form of the occupation? The line about night being “confounded” by day is perhaps the most powerful of all. In an obscene world of cruelty and madness, darkness is preferable to the light of day. Darkness at least brings us a sense of respite from the murderous depravities. The essay also addresses Israel’s tiresome and incessant demands from one and all–including the very people it has displaced–for recognition of its “right to exist.” And there is also a backhanded slap at Arab governments which, in exchange for cordial relations with the Zionist state, have all but abandoned the Palestinian struggle (other than the payment of occasional lip service). Here a June question arises: if the decision to make war was an Arab decision, why should the decision to make peace be based on a Palestinian agreement to absent himself? Here the Greek tragedy and the Shakespearean tragedy are completed: the Palestinian is expected to absent himself from his homeland, from his problem, from his case, and from himself. He is requested to appear on stage only once. He who is absent is asked to appear to witness that he is absent, invisible; he is supposed to come only to recognize Israel’s existence, Israel which is present only on the condition that the Palestinian is absent. Then the Palestinian is supposed to disappear. He is also supposed to present himself before the Arab ruler to acknowledge that he does not represent himself, to admit that he is absent from the stage in the presence of the one who has requested him to attend once for the sake of permanent absence. We must realize again that June did not come from outside as much as it sprang from within. Is June still alive within us? We have witnessed twenty years of occupation. But also twenty years of steadfastness of a people surrounded and besieged by occupation. Twenty years of embers springing from the ashes. Twenty years of the crystallization of the Palestinian national identity. Twenty years of shaping the miracle. That essay, as I say, was published in June of 1987. Six months later, in December of 1987, the first intifada broke out. No cause, not even a just cause, can make legitimate the killing of innocent civilians, no matter how long the list of accusations and the register of grievances. Terror never paves the way to justice but leads down the shortest path to hell. We deplore this horrendous crime and condemn its planners and perpetrators with all the terms of revulsion and condemnation in our lexicon. We do this not only as our moral duty, but also in order to reassert our commitment to our own humanity and our faith in human values that do not differentiate between one people and another. Our sympathy with the victims and their families and with the American people in these trying times is thus an expression of our deep commitment to the unity of human destiny. For a victim is a victim, and terrorism is terrorism, here or there; it knows no boundaries nor nationalities and does not lack the rhetoric of killing. A Palestinian girl lights candles in tribute to Darwish. That article, condemning the horrendous attacks, was published in a Palestinian newspaper on September 17, 2001. As was the case with most people in the world at that time, it obviously had not occurred to Darwish that 9/11 may well have been a false flag, with Israel as the possible principle perpetrator. In any event, the marked sympathy he shows for Americans should be noted–it is a distinctly humanist perspective, coming from one of the leading intellectuals in Palestinian society, this despite America’s ongoing support for Israel. In 2001, America truly had the sympathy of the entire world. We managed to squander it. Our response to 9/11 was to bomb and invade one country after another–in wars that were relentlessly advocated by Jewish neocons and the Zionist-owned media. Yet, for all his collective significance, Darwish was often reserved and his poetry was born from very personal experiences. For instance, he grew up convinced he was unloved by his family, especially his mother. But, when he was jailed in Israeli prison in 1956, he wrote “I Long For My Mother’s Bread,” which has become a Palestinian classic in the voice of Marcel Khalife. “I wanted to atone for my feelings of guilt toward my mother for thinking she hated me—as a poem of national longing. I didn’t expect that millions would sing it,” Darwish said. Indeed, for countless Palestinians estranged from place and family, this particular poem was embraced as a national resistance poem, where the mother symbolizes Palestine. You can follow the link to access the full tribute to Darwish. At the bottom of the article you will find the links to the other articles. These include a link to the essay, “The Cruelest of Months.” Take note, however, that the articles are in PDF format and will only be available for the duration of the month of August. So if you wish to read them, do so now.